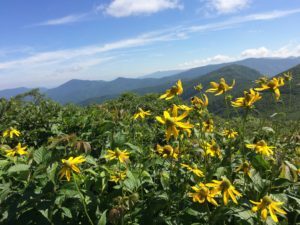 Pumpkin picking, leaf peeping, getting lost in corn mazes — fall is a season full of outdoor activity. But people aren’t the only ones on the go. Squirrels are busy in the fall, bulking up for the winter with extra food and storing nuts, acorns, and seeds for later. Some of these squirrels appear grey with white bellies. These are eastern grey squirrels, and their habitats vary from woodlands to parks to neighborhoods – anywhere food is predictable and abundant. And while the squirrels are often easy to spot the ground or on the trunk of a tree, there’s another way to know they are near. You just have to look up. As the trees are shedding their colorful leaves, you may see a large clump of dead leaves wedged among the branches 20 or more feet up the tree. This leaf nest, called a drey, was created by a squirrel. It was built in the summer and will be used throughout the winter. 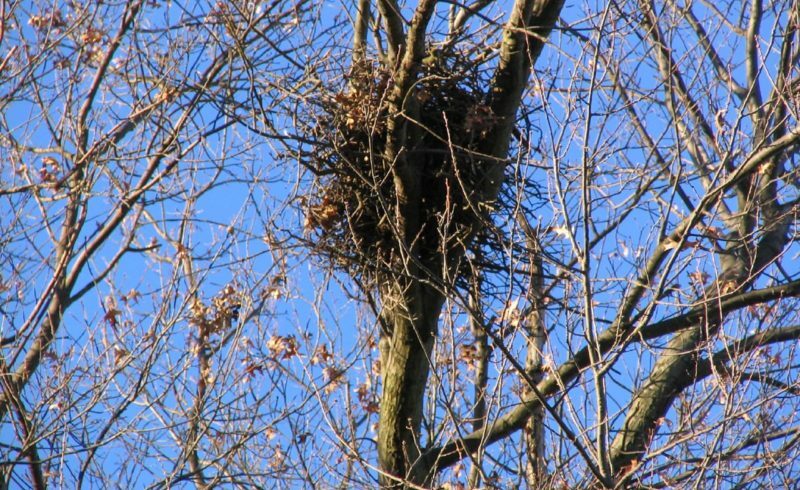 Although a cavity den, a nest made in a hole in a tree, offers better protection from wintery weather, a leaf nest provides enough shelter in areas where dens are scarce. And it’s much sturdier than it looks. 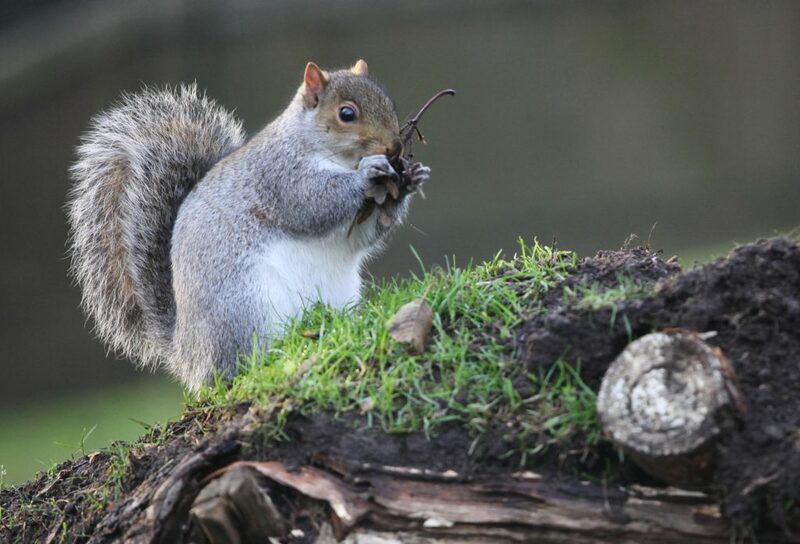 Squirrels build leaf nests in trees with large food supplies, including oaks, beeches, and red maples. They often choose locations with built-in support, such as a tangle of grape vines or where several small branches come off of a larger one. The squirrels start by roughly weaving together a platform of live green twigs. Next comes damp leaves and moss, creating a solid base for the nest. More interwoven twigs and vines form a sort of spherical shell around the base. Then an outer shell is created with moss, twigs, leaves, and sometimes paper. It can measure up to two feet wide and a foot high! The inside of the nest is about six to eight inches wide and has a soft lining made up of grass, leaves, and shredded bark. Squirrels often have second and third homes, though these are more loosely constructed. 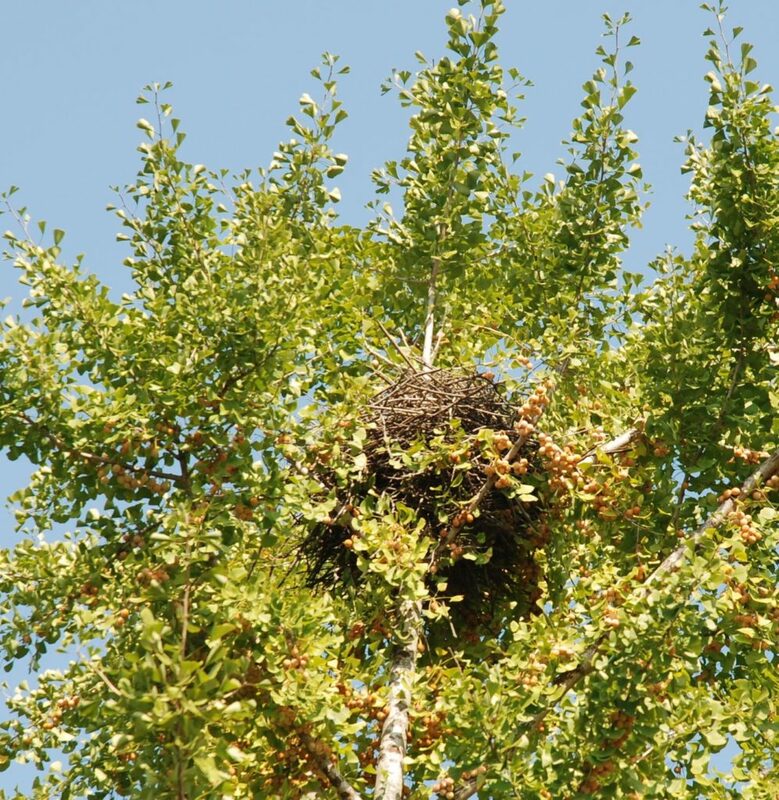 These nests may be as simple as a pile of leaves and bark heaped onto a twig platform. The extra nests provide safe places for the squirrels to run to while they are out feeding. Squirrels may also stay in these nests if food around the main nest becomes scarce. Although squirrels usually live alone, they may double up in a nest for warmth. During mating season in December and January, they will sometimes share a nest with their mates. In the spring, females raise their first litter of young in their nests. 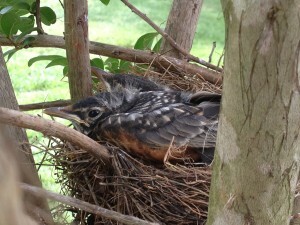 Then, in June and July, the spring babies are grown and practice building nests of their own. The mother squirrels repair their nests or build new ones as they get ready for their second litter. But fall is the most active time for nest-building as the squirrels prepare for winter – and one of the easiest times to spot these leafy homes.